Remember to add our email to your list of non-blocked email. or Thru & Thru (an Interlude look a like) will not be listed. Visit the Illusion Hotline for Authorized Builders of many Illusions. It was built by a furniture builder using my specs and Paul Osborne plans. The inside trunk comes down even and the person inside is in control of the bottom trap of the inside trunk. The inside trunk needs to be painted or covered on the inside. I used strong contact paper but it has not been used so the covering is starting to come off. This is the Original Losander incredible floating table. A solid table is seen to rise from the stage and float about in a most mysterious manner all the while under full control of the magician. This prop has been accentuated with decorative golden fringe to add to the attractive look of this piece. (the flat face of the table top has several minor pin-holes in it having been used to temporarily attach other items to the table top. There are also some velcro strips added. These small holes are always covered by the cloth in performance. Otherwise this prop is in perfect like new condition. Prop breaks down and packs in case included. This was previously owned and sold on Magicauction by Brett Daniels. No Instructions included. From Osborne's HAUNTED ILLUSIONS book..... The Lumberjack's Dream Illusion. One of a kind, built by Chalet Magic. 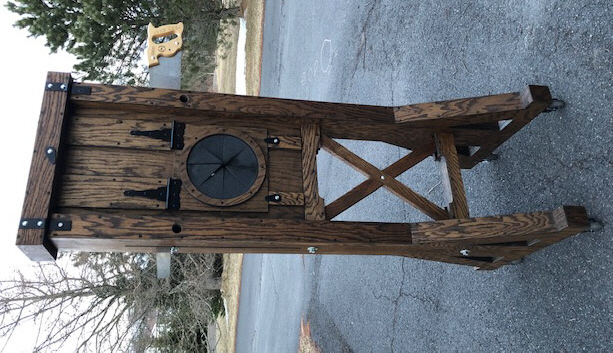 An amazing alternative to the guillotine. A lumberjack's "sawdown stock" used to trim smaller tree limbs is introduced and a head of lettuce is placed in the opening. The large saw blade is released and the lettuce is easily sawn thru and falls into 2 pieces. A volunteer is brought on stage and the front panel is lowered as the saw is brought back up and two carrots or wooden support pegs are put into holes on the uprights. The volunteer's head is inserted thru the foam slits in the front door and on the count of 3 the saw is brought down back and forth sawing thru the pegs and the volunteer!... All is reversed and the volunteer is released unharmed! Built like a TANK! Over 6' tall.... Excellent condition & Includes 2 chalet strapped fiber cases. Bolts together in minutes. Both ends of the saw blade are seen throughout and travel up and down as well as back and forth in a natural sawing motion as you saw through the objects without harming your volunteer. 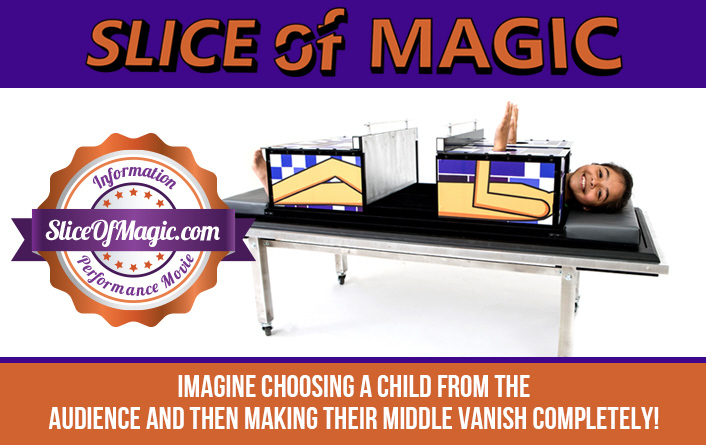 This sensational illusion is packed with great features, it can be performed anywhere, even surrounded, light weight and packs very small, and the use of bamboo poles removes the weapon stigma allowing you to perform this illusion even in school. Best of all its a great fooler. Your assistant steps into the box, but has trouble squeezing inside due to its small size. Magician covers assistant with a large foulard which mysteriously allows the assistant to seemingly melt into the box. The cover is placed on top and the foulard is removed. Next the magician thrusts all four bamboo poles through the box, finally the longest pole down through the center of the box, and out the bottom. The poles are removed and the foulard is placed over the box, the lid is removed from under the foulard and the magician now steps into the box. Causing the audience to wonder where the assistant could be. After stepping out he raises the center of the foulard. Then suddenly it rises up higher and higher he pulls it away and the assistant is seen standing totally unharmed. An audience members are invited to inspect the fine hard wood stocks and metal blade. Magician then demonstrates how the blade fits into the stocks. The blade is then lifted up so the volunteer(s) can place their hands through the holes in the wooden stocks, below the blade. Their wrists are then handcuffed together, locking them into the stocks. The blade is then pushed down into the stocks. Passing through the volunteers wrists without harm. The wooden stocks are then dismantled, showing each part. The spectators wrists are seen to be locked inside the holes of the blade. And the handcuffs are still locked around their wrists- Making this utterly IMPOSSIBLE! Metamorphosis trunk on casters, built with birch plywood. Easy pin hinge assembly/disassembly with collapsible sides. Dimensions: Width 33.5 inches Length 44 inches Height 32 inches. Includes: (4) Master padlocks & keys. Curtain, frame and sack with blueprints for the trunk. slight tear but Works Great. This gorgeous Stretcher Illusion was the last one Owens Magic ever made. It was built in 2001 from the original Thayer Magic plans. It has been performed once on stage and once on American television. Effect: Assistant enters the beautiful illusion and sticks her head, hands and feet out the front. Ropes are attached to her. The magician then pulls on the ropes stretching her completely apart! Her head even bounces up and down as well as rotates a full 360 degrees around! She is then brought back together and exits the illusion unharmed. The Owens Magic craftsmanship on this beauty is incredible! The purple velvet front against the carefully carved wood pops brilliantly on stage. The column legs are each hand spun and painted in gold only as Owen Magic can do. Extremely high quality with amazing detail. Can be shown empty and then immediately produce a parade of ladies, animals or the performer. Can be used to produce or vanish. Two methods, mirror tube on the back not included or trapdoor and mirrors on the bottom included. House is almost perfect condition with a few minor scratches. 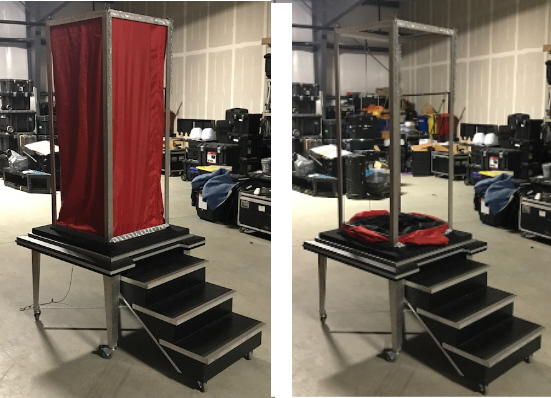 This cabinet can stay on the base or be lifted into the air to make a person disappear. The unit is large enough to fit a man. This item doesn't come with a packing case. 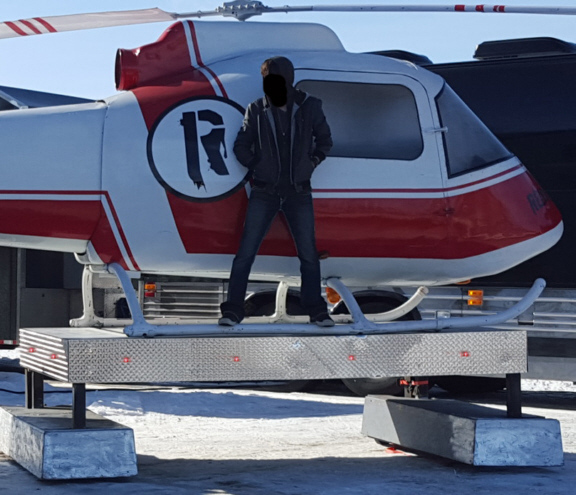 This illusion was designed as the world's fastest appearance of a real helicopter. The platform can be easily adapted to make any type of large vehicle, object, aircraft, etc. appear in 3 - 5 seconds flat, depending on the venue. The inner workings are ingenious in design, allowing the platform to be completly inspected by audience members from all angles, moments prior to the appearance. Auction is for the platform and appearance mechanism only - Supply your ownaircraft/ vehicle etc. This is a huge reputation maker with limitless possibilities! No assembly required, simply take off the lid of the case and you are ready to go. Works perfectly. Instant switch. Shipped from Canada. 55 1/2 tall x 96 1/2 long x 4 wide - 1,100lbs. The use of this prop is only limited by your imagination. Check out the video link for one version of this incredible illusion. Comes with fake steps for run around if you are working on a stage without a trap. Comes with all necessary extra rigging to lift the prop like in the video. Could also be rigged in a venue that has a grid. For sale is a custom made table, made in the matching style of Wellington's Floating Table, that can be thoroughly examined and used as a regular table throughout a show. It is very solid, strong, and heavy, a great touch to later validate the lighter floating table version. We used this for our Glowing Gypsy Thread effect, which was in the beginning of our show. We then performed with the matching Floating Table towards the end. This table can hold a wide variety of props, including heavy items, and is perfect for any type of close-up magic. 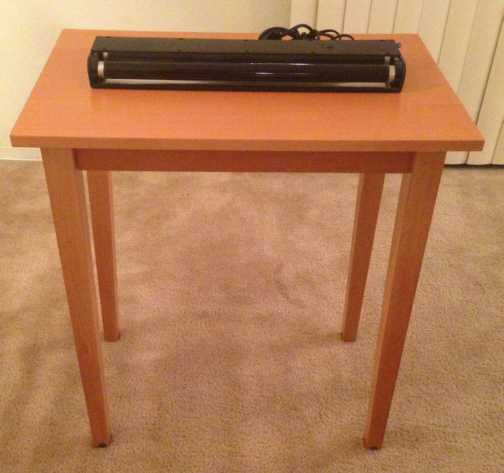 Also included is a professional grade table top black light fixture for use with glow/UV thread. The light is powered with electricity, has an on/off switch on the top, and sits flat and low profile on the table. It directs a strong light straight upwards to perfectly illuminate the thread in your hands for a classy and extremely effective Gypsy Thread presentation. Its also packs flat for transport and assembles in less than 5 minutes. All items are in excellent/like new condition. For sale is a one of a kind prop, expertly built by EDF. In the effect, a pair of regulation handcuffs are examined by the audience. They are real and police grade. The magician is then handcuffed and enters an industrial copper/bronze diamond plate box, which is locked and sealed by an assistant wearing a long, hooded monk robe. The monk/assistant then turns a crank on the attached lifting tower and the box is hoisted 8ft above the stage by the self-contained winch system. This isolates the box and the magician inside in mid-air. The monk then touches a torch to the front of the box. Instantly, with a flash of flame and sparks on the front panel, all four sides of the box fall flat, leaving just the thin, open framework. Magician has completely disappeared. Suddenly, the monk that has been assisting the entire time removes their hood and, to everyone's surprise, it is the magician! 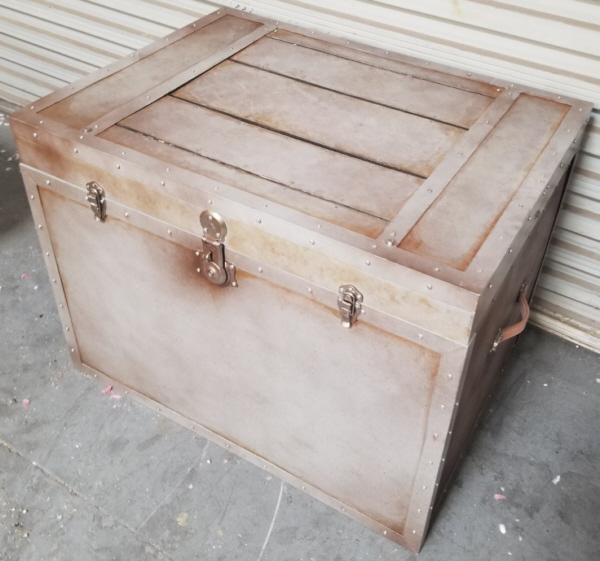 This amazing prop features an invisible trap system, so that when the box is lifted, it looks completely solid and impenetrable from all sides. It also features a single point release system that causes all four sides to spring open at the same time and fall flat and a removable frame for new flash paper/sparkle powder to be easily installed each time on the box front. 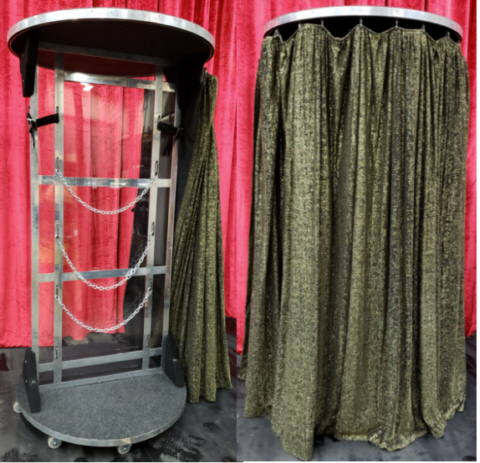 Self-contained, no rigging needed in venues. Use any mirror box, base, steps, or black art platform for the getaway. Includes a pair of industrial grade police handcuffs from Cannon's Great Escapes, two custom full-size monk robes with hoods, an aluminum torch for lighting the front of the box, and 2 cases, all in brand new condition as well. Assembles in minutes and will also fit in the back of an SUV for transport. The incredible illusion of one person passing through another! This illusion has seen a lot of shows, and is still in good working condition. Please see the video to see the actual prop being offered. Includes ATA case. Arms come off for transport. Seller will include a video of set up and breakdown and illusion tips to buyer. This is a custom made sub trunk that can fly as checked luggage. Two lite-flight buckle and strap cases no more than 60lbs includes curtain. CASE 1 : 6.5" x 40.5" x 26.5 - CASE 2 : 6" x 40.5 x 31.5 - Trunk: 38 Wide x 24.5 Deep x 28.5 Tall - Only used twice for some overseas corporate gigs but doesn't fit my style and hasn't been used in several years so wanted to clear out the warehouse. Made by Bill Smith with custom paint job by Temika Sperry. Aluminum and some wood. Assembled with wing nuts and bolts. When i used this I was over 145 lbs and am 5 foot 10 inches - no problem with sturdiness it held the wear and tear and weight of me and the assistant swapping etc. Perfect up sell illusion if you have to fly to a gig or even to take up little to no space in your car etc. Can easily fit in an economy rental car. Cases and trunk in great shape. Includes curtain and all hardware - No lock or bag. Includes curtain and all hardware etc. Originally cost $6,000 with Cases made by encore. Effect: magician places a CD or similar thin item in between the center of the two funnels. Magician then turns on the lights which are located above, below and on the back of the illusion they are powered by a motorcycle battery hidden within the illusion. The magician then crawls through the funnels from one side to the other. Thus shrinking his body through a tiny hole in the Compact Disk! The illusion is fully self contained and requires no power from an outlet. The frames that hold the lightbulbs are polished aluminum and look fantastic.This illusion is incredible & highly visual! It can be turned all around prior to the performance. It provides for an amazing press photo. Illusion has seen a lot of shows but is in good condition and ready to perform. Comes with an ATA case that is well worn with many miles still left to go. 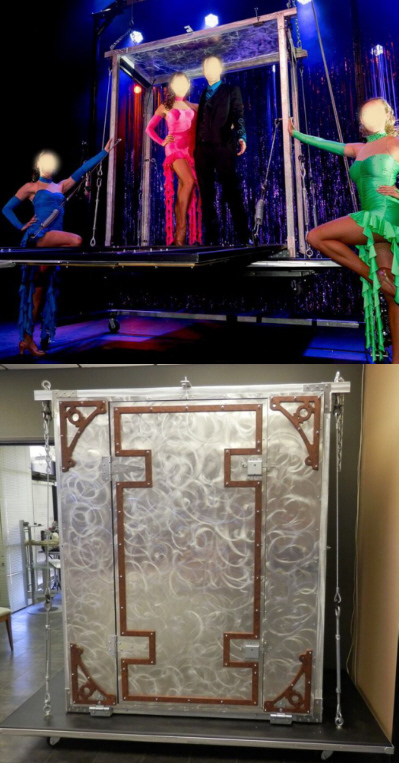 The illusion was professionally built and cost $12,500 originally. no case or crate....pick up only in Florida. is also available on Page 3. This powerful, one of a kind appearance was expertly built by Bill Smith and designed by a renowned touring performer. It is one of the fastest motorcycle/large object appearances ever created. In effect, a large platform is on stage. The audience can see under and around it at all times. Lights can be placed to shine from the back of the platform through the empty space as well. A fire is lit on the table top and a translucent cloth is lifted up in front of the platform by two assistants with poles. The flames can be seen glowing through the cloth. Instantly, the glowing fire transforms into the shadow/silhouette of a full-size motorcycle and rider. The cloth drops to reveal that the flames have transformed into the magician on a roaring 500lb motorcycle. The effect is absolutely stunning. Any motorcycle can be used. The platform also has 8 built in CO2 jets for smoke and a wired remote control for smoke and light activation. Included with the illusion are 2 Encore ATA cases. Also included are full performance rights for this original illusion. There are so many cheap motorcycle appearances out there - this is a professionally built prop by Bill Smith Magic Ventures in Las Vegas. Press the switch and watch magic happens in front of your eyes!! First electronic vesion of a coin matrix in the world! No Coin Manipulation or Sleights required. Electronic CCM1 is not for close-up magic. The best use is to do it on stage (like many performers today doing close up magic) with a camera and seen on a large screen. No time consuming practice time - the board does all the work you just concentrate on presentation. To perform Electronic CCM1 correctly proper lighting is necessary. Each performer will need to determine the lighting based on when, where and how he performs. 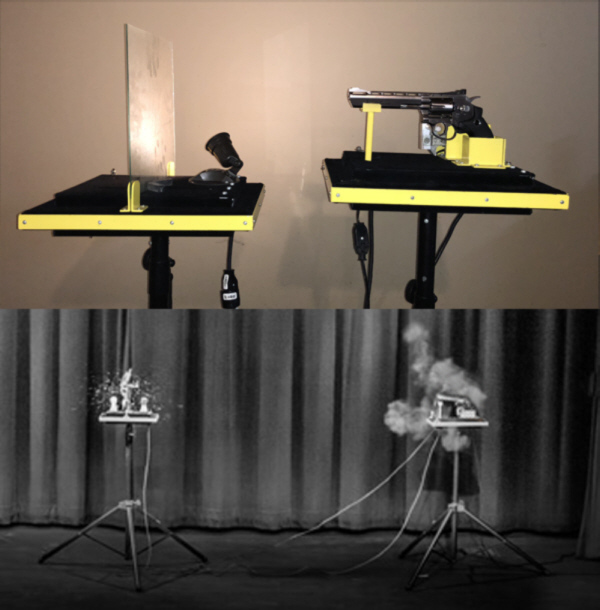 After 1 year of research and development, Black Star Magic proudly presents the world first fully automatic Matrix. The electronic system allows an interaction with the board without any physical contact. 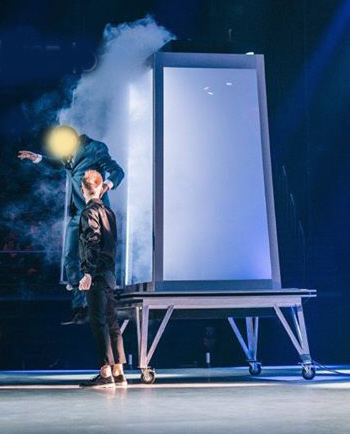 The matrix has been made in collaboration with Eric Chien (globally known as the most talented close up magician and one of the winners of FISM in Asia 2017. The exclusive launching offer includes plenty impressive effect, as well as our exclusive smoking device. We are please to announce the new version of our popular Chinese Coin Matrix (CCM) effect, The CCM II.ý Our talented team has worked very hard to bring you a whole new routine with better visual results, mixing coins scenes and ending with live dove and rose appearing. You can now choose to perform this part of the effect with feathers or petals of roses for a wonderful magical effect. Our main focus was to create an incredible effect that's so easy to use that anyone without any experience could perform it. Note that, this trick is essentially to be used on stage and is not really suitable for close-up performance. We recommend a distance of 3 meters with the correct set of lights and live broadcasted on LED screen or any TV or large monitor. Important points: Make sure to have proper lighting before performing the effect. No manipulation (sleight of hand) of coins are required to perform the CCM II One of the routines could only be performed through camera video recording having a special angle. The CCM II includes all props with feathers and rose petals that's needed to perform this effect. It is important for us to bring to your attention that many low quality copies of our products have been made from non registered companies. We care about you, please make sure to purchase legit products labeled Black Star Magic. Our products follow a high quality standard with safety norms. Very good condition and an almost new fiber case, which comes with the four locks and chain (I will throw in a ring but it needs a little repair). to the footlights and tossed into the air - the cage and the doves have both vanished completely. Apparatus is made to perfection by Owen Magic. the performers mouth. A classic rarely seen anymore. Comes with gun firing stand, glass holding tray on stand, bullet tray, several pieces of glass cut to the proper size, and carrying case. Supply your own 9mm bullets. 12 inch diameter and weighs approximately only 200 grams. It's coated with silver mirror paper tiles,handcrafted and comes complete with the special carry case and all the gimmicks, thread you need to rig and perform the Luis de Matos version of the amazing classic illusion. Only used once and rehearsal, like new condition. This is a new version of a great classic. This one of kind apparatus boasts a rugged machine appearance. The magician is in complete control as he can lift and lower the smaller box into the larger box by himself, instead of requiring the traditional two outside assistants who ordinarily would be required to do the lifting. A self-contained hoist and tracking system does all the work. Four doors on each box spring open to reveal the surprise second persons appearance. No Cases included. (in photo), neon signs, lights, audio equipment, laptop computer, piano stand, and 2 animatronic figures from Axtell Expressions. Animatronics can be controlled free style via included remotes, or programmed to sing songs. 4 Pre-programmed songs + dialogue included. Detailed instructional video(s) will be made for the buyer. Animatronic figures are approximately 3 feet 6 inches tall (107cm). Their use is only limited by your imagination. Thin model Sawing in half, beautiful condition as you can see in the photos the paint is phenomenal. Owen Deluxe 2 Girl Sword Basket with Encore case. This is an original Owen Magic Supreme illusion, improved by Bill Smith using a fiber glass coating to make the inside smooth. The beautiful hand painted table is also built by Bill Smith. The basket & table will easily hold 2 assistants. Everything fits in an Encore case. The table goes upside down in the case & basket fits in between the legs of the table. This illusion is provided with the original Owen's Swords and Basket, and the Bill Smith Magic Ventures hand painted table and beautiful cloth seen in the photo.